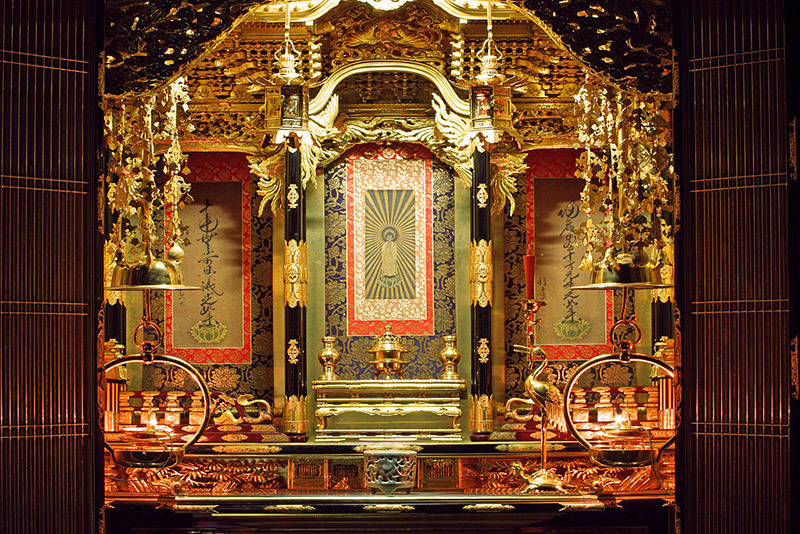 Have you ever been to a temple in Japan and thought, "I wish I had some of this amazingness in my house?" Then the Japanese butsudan 仏壇（） is for you. A butsudan is a small, household Buddhist shrine. Its exterior often resembles a simple cabinet, with two outward opening doors. Of course, they can also exhibit more elaborate and elegant, designs. The inside is what makes the butsudan so special. It houses a religious icon, namely a Buddhist statue or image. The name-tablets of one's ancestors are harmoniously positioned alongside it. 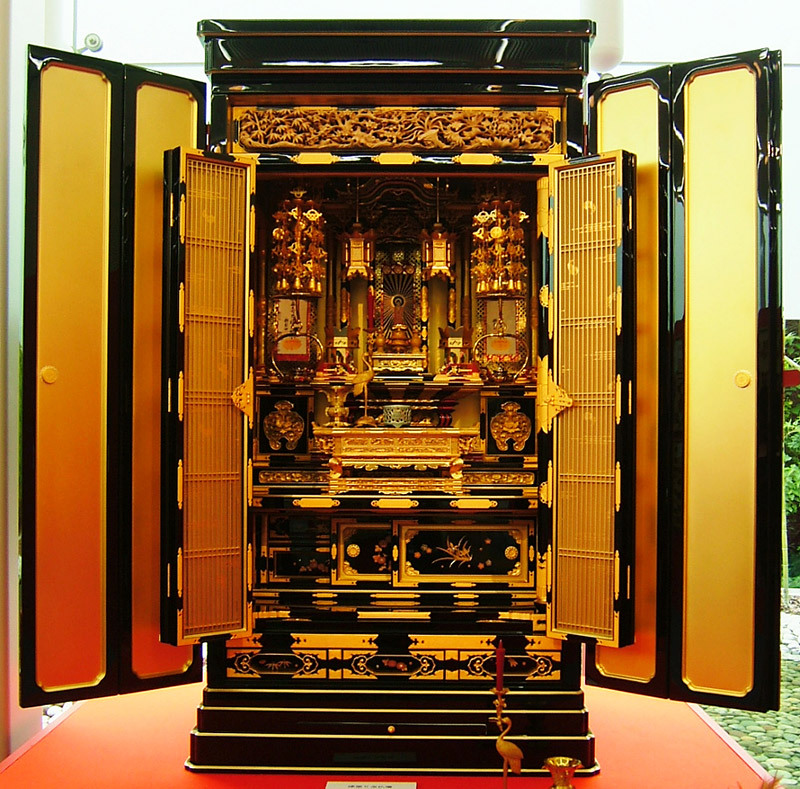 A plethora of religious items called butsugu are also arranged inside. The butsudan is actually unique to Japan. No other Buddhist countries partake in this practice (except some Mongolians). Because there are so many temples in other Asian countries, people don't need to make altars in their homes. Wait a minute. There are a lot temples in Japan too! 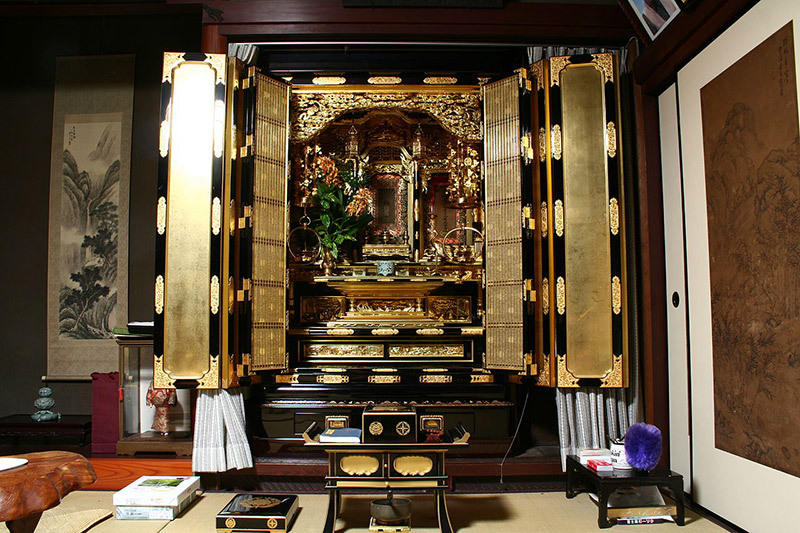 Why do Japanese people need an altar in their own homes? When did this custom start? Let's uncover the mystery of the Japanese butsudan. The butsudan actually has its origins in ancient India. Practitioners of early Buddhism made a platforms of mud and venerated gods there. It wasn't long before roofs were added to shelter the platforms from rain and wind. It's said that this is the origin of temples. Buddhism eventually made its way to Japan via China, where it took off. 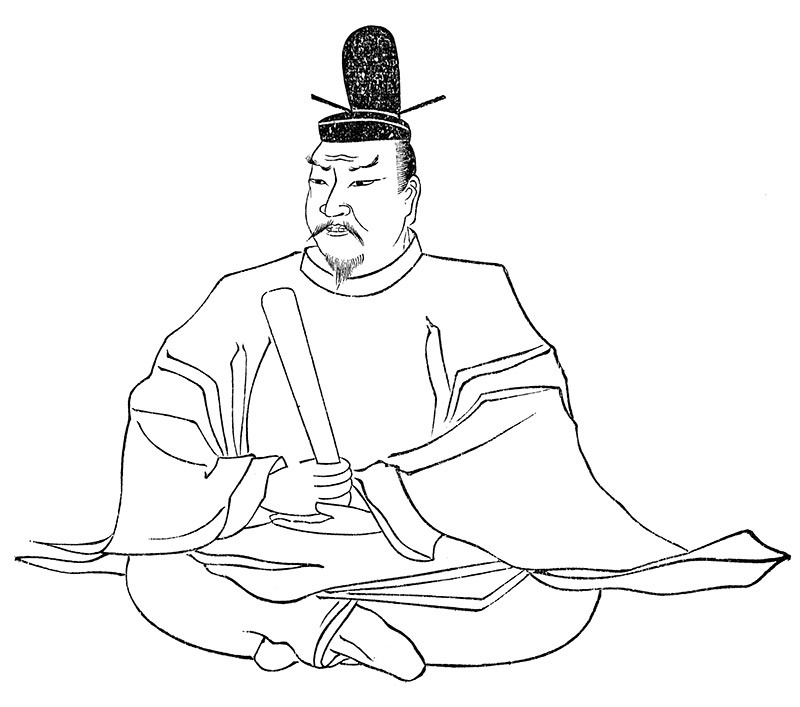 On March 27, 685, the Japanese Emperor Tenmu issued an edict. It stated that each family in every country (pretty presumptious of him, eh?) must make a Buddhist altar that holds a statue of Buddha and the Buddhist scriptures and conduct prayer and memorial services in front of it. The 27th day of each month was designated as "Butsudan Day" by the Zen-Nihon-Shuukyou-Yougu-Kyoudoukumiai (全日本宗教用具協同組合), which literally means "Japan's Religious Utensil Dealer Cooperative." And that's where butsudan came from. Right? The current butsudan is not directly descended from the above-mentioned imperial edict. So how did the current butsudan come to be? There are actually two theories. Some of the nobility had their own jubitsudou 持仏堂（）. This a private place where a Buddha statue and ancestor tablets were kept. During the Nara period, the arrangement of items was set up in a small building outside of the house. However, it only began to be placed inside the house during the Heian period. 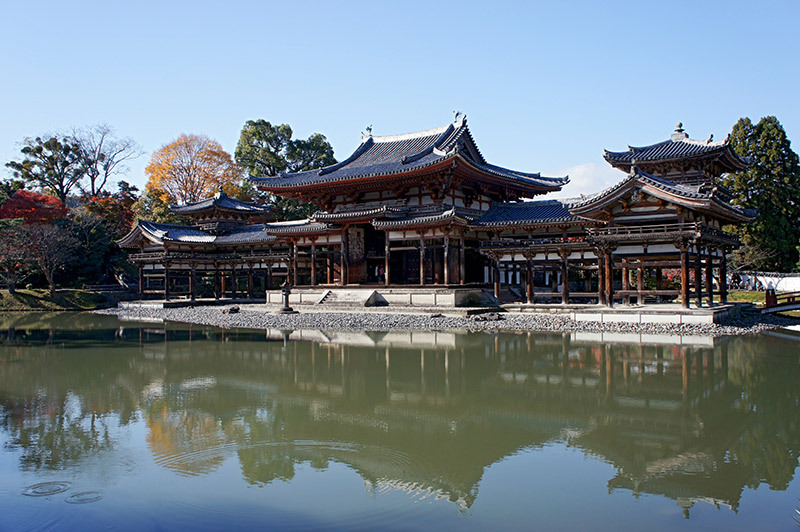 For example, Fujiwara-no-Yorimichi (藤原頼通, 992 – 1074) had Byoudouin-Hououdou (平等院鳳凰堂, Phoenix Hall of Byodoin temple). Ashikaga Yoshimitsu (足利義満, 1368-1394) had Rokuonji (鹿苑寺 Kinkakuji temple). These massive complexes acted as their own personal jibutsudou. According to famed historian Takeda Choshu (竹田聴洲, 1916 – 1980), the above mentioned jibutsudou was eventually made into the smaller butsuma 仏間（）, which means "a room for Buddha." It was further reduced into what we now know to be a butsudan, so that it could be put indoors. 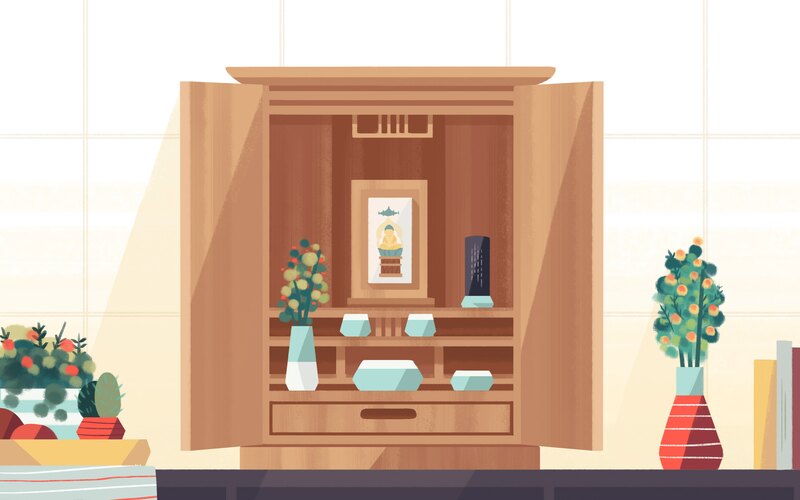 Tamadana 魂棚（） literally means a soul shelf. 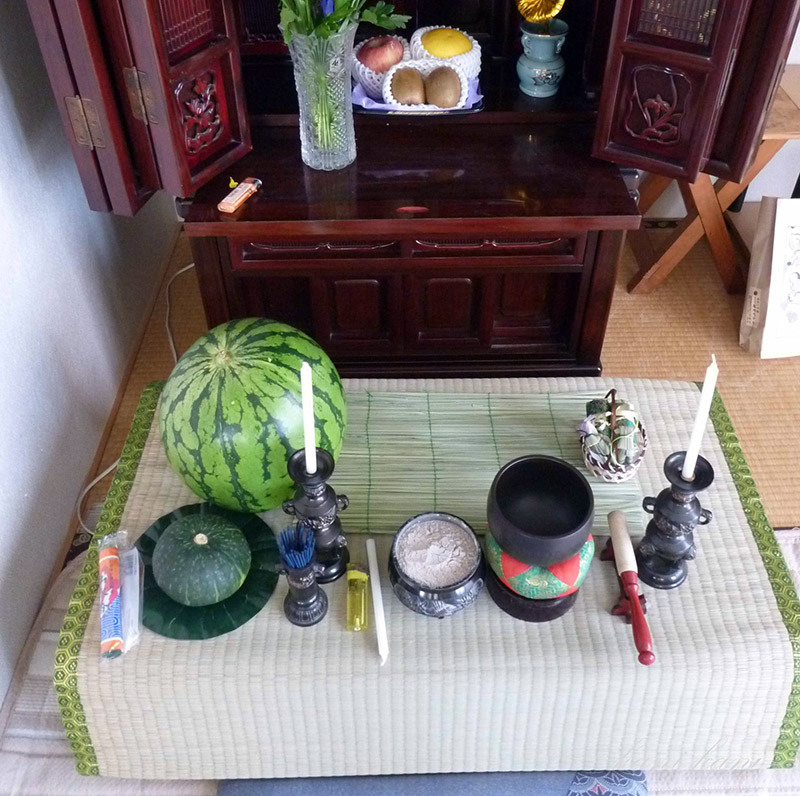 In practice, it is an altar to greet spirits of ancestors and the recently deceased during Obon. While its shape varies by region and period, one example is a board affixed to four upright corner pillars made of bamboo or wood. With this image in mind, it's not surprising to learn that people often used tea tables instead. The father of native Japanese folklorists, Yanagida Kunio (柳田國男, 1875 – 1962), claims that the tamadana birthed the modern bustudan. It transitioned from its temporary Bon festival usage to a place of permanent installation and eventually became the butsudan. 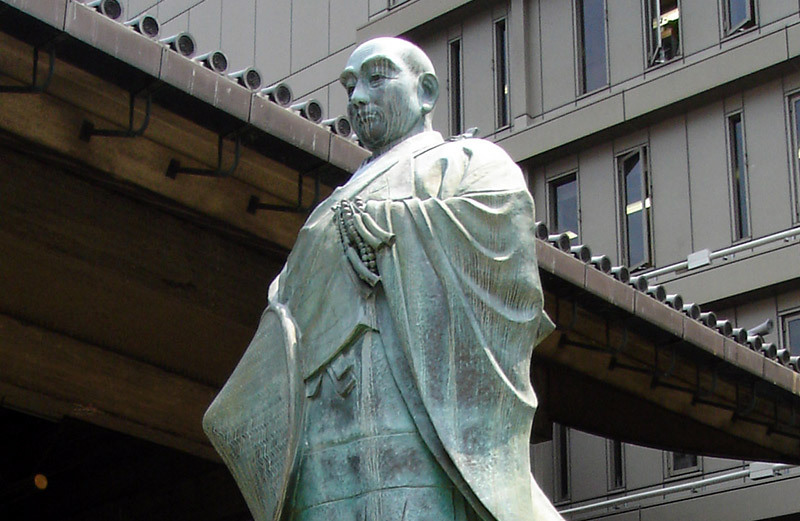 In the Muromachi period (1336 – 1537), the eighth head of Hongan-ji temple was named Rennyo 蓮如（）. He restored the Jodo Shinshu sect and gave his followers scrolls with the script namuamidabutsu 南無阿弥陀仏（）, which is an homage to the Buddha of infinite light and life. He encouraged them to enshrine the scrolls in their own butsudan. When they made their own butsudan, they imitated what was found in the head temple of their respective sect and made it out of gold. This paved the way for the current kin-butsudan, which literally means golden butsudan. The Jodo Shinshu sect set many standard rules regarding the butsudan. Even now, the sect says the principal image of a butsudan should be a hanging scroll acquired from the head temple of a family's ancestral temple. Eventually, butsudan spread outside the Jodo Shinshu sect as family mortuary tablets became common. In the Edo period, the Shogunate created a system called terauke-seido (寺請制度 ) in which a Buddhist temples certified people as members of their temple. This new system forced individuals to choose a specific temple for their family and support it. To demonstrate membership to the temple, each family had to install a household butsudan for morning and evening worship. Additionally, they were asked to invite a family temple priest to hold memorial services to commemorate the anniversaries of their ancestors' deaths. This custom became widespread among commoners and the butsudan became an integral part of Japanese family life. The arrangement and types of items in and around the butsudan vary depending on sect and the size of butsudan. A butsudan usually has doors with an embellishment of a temple gate and three stairs. The highest stair is called shumidan 須弥壇（） and is reserved for the most important butsudan item, specifically a Buddha statue. The area above shumidan is called kyuuden 宮殿（） and is considered the holy place. It is the area within the butsudan that must be occupied by the Buddha statue, which tipically rests on the shumidan. Alternatively there could be an image of Buddha placed on the back wall of the butsudan, occupying the holy place. An accompanying statue or image of Buddha is placed on one side of the butsudan and the founder of the respective sect is placed on the other side. There is a vast array of items (butsugu) that could be placed in the butsudan. But it would take up a lot of space in this article, so I'll skip those today. While there are many things inside a butsudan, there are also some things that don't belong. "Officially," photographs should not be placed inside. 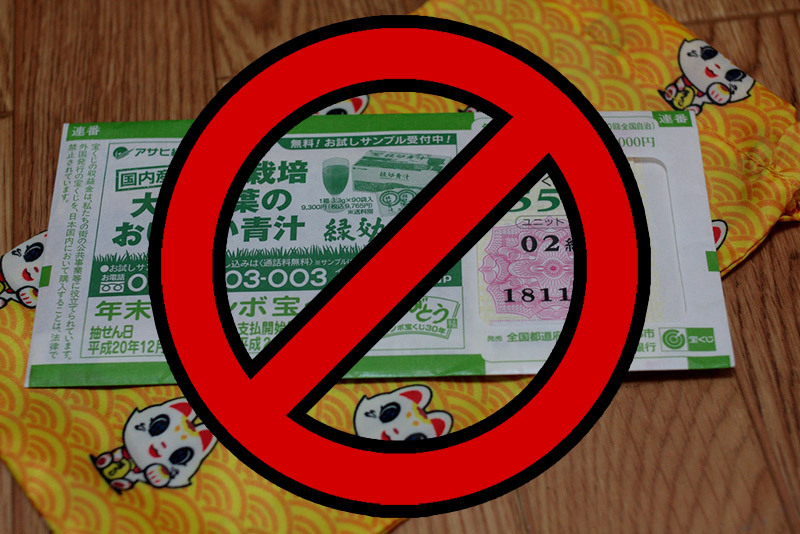 Neither should certificates, trophies, or lottery tickets because a butsudan is not a place to expect benefits. Despite this, many people put these things in their butsudan. In fact, my family in Japan places stuff like this in their butsudan all the time. I once asked my mom why we place things like that in our butsudan, and she said it was to let our ancestors know how we are doing. Although I'm not sure if my ancestors can actually see that stuff, I guess it can't be completely wrong since the butsudan is used to pray to your ancestors anyway. How Much Does a Butsudan Cost? According to research conducted by いい仏壇.com in June, 2011, most people pay between 100,000 to 500,000 yen for their butsudan (about US $1,000 – $5,000). While not the majority, a staggering 20% people paid over 500,000 yen for theirs. Even more impressive is that 1.2% of the people paid over 2,000,000 yen. Considering only one percent of people pay more than 2 million yen for a butsudan, 63 million yen seems completely ludicrous! Someone on Niconico Douga, a Japanese video sharing website, bought a butsudan for 63,000,000 yen (about $630,000)! This incident occurred on August 7, 2008. It went for a price never before seen. Before this, the product which made the most money on the Niconico Douga online market was Hatsune Miku vocaloid software which sold for 28,900,000 yen. Of course, this is an aggregated price of everyone who ever bought that product, so naturally it would be that high. The butsudan not only broke the record and doubled that number, it did it with one sale. Everyone thought that the overpriced butsudan was a joke. More surprisingly, the exact same butsudan was sold again the next day for the same price! This, of course, became huge news. Niconico market only counted it as a sale after the product was shipped. This was to make sure it wasn't a fake order. Letting the time lapse on the site's cancelation/shipping agreement makes this a possibility. Once it was shipped, the sale of those two butsudans was finalized. On August 11, one more was sold, as well as a 62,000,000 yen butsudan. On August 15, another one was sold. The world never ceases to amaze. However, on August 18, the butsudan shop which originally posted the butsudan in question, announced they filed a police report about fake orders. They wanted to identify the criminal and demand compensation. The following day, two more 63,000,000 yen butsudan were sold. The butsudan posting was deleted on August, 24th. It seems likely that they could have all been fake orders, but nobody knows if every single one was. It's possible that some of them were jokes and others, likely fewer, were real. At any rate, even if one was real, buying such an expensive item online is pretty ridiculous. Best Place to Buy Butsudan? No matter the price of the butsudan, buying one online is pretty crazy. We're talking artisan craftsmanship here. These things are gorgeous and ornate. Not something you really want shipped in a box. There are lots of places to buy butsudan in Japan. But probably the most unique is in Kanagawa. You can buy butsudan in a drive-thru. No, マクド didn't start selling butsudan. This is a real place where you can shop for butsudan from your car.